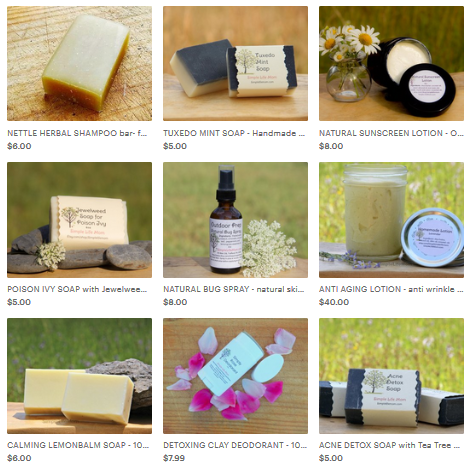 Natural handmade soaps are wonderful for the skin and fun to make. 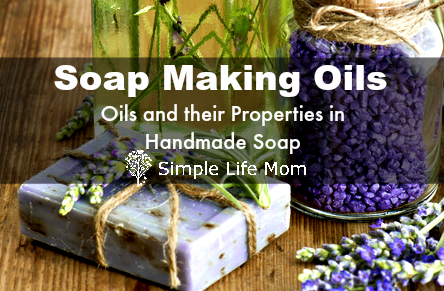 If you’ve never made soap, just getting started, or are an experienced soap maker, it’s important for you to better understand which soap making oils are better for what you’d like to accomplish. In other words, different oils bring different properties to soap. I’ve had long, indepth discussions with other soap makers about what is left after saponification and how oils can impact the type of soap you can make. After years of experience and research I’ve put together a list that I hope will help you better understand soap making oils and their properties so that you can begin to create your own recipes and know when a soap recipe has everything that you’re looking for. What happens when you have everything but one oil in a recipe? Knowing which oils give hardness or moisture, conditioning, or creamy bubbles can help you replace that one oil you don’t have with another. For example, if you don’t have coconut oil, but you know it adds cleansing power and hardness to your bar, you can find another oil that may help provide those properties as well. When you have one you’d like to try in its place you can go to a lye calculator, like on Soap Calc, and plug in the oils that you want to use and double check your numbers. You can also see what the predictions for your recipe are in the areas of cleansing, hardness, conditioning, etc. You’re on your way to creating your own soap recipes! Choosing a recipe that someone has already made is wonderful (Check out all of my recipes from THIS PAGE), but it’s also creative and fun to be able to put together your own recipes. The information below can help you choose which oils will give you the benefits you are looking for. If moisturizing is your top priority, then you can learn which oils are highly moisturizing. If you want to make an anti aging face bar, like this one, that is high in vitamin A and linoleic acid, then choose those oils below. 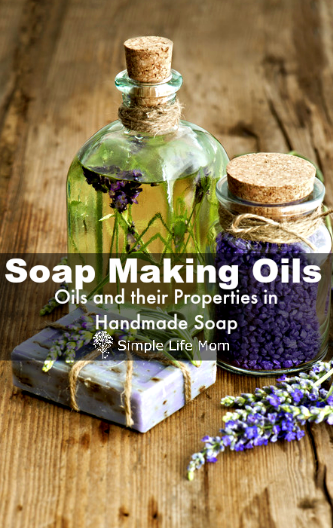 Combine those with hardening oils and oils that help with bubbliness and you are on your way to creating your own soap recipes for cold process soap making or hot process soap making. There are, of course, many other oils that you can use. These are very popular oils that soap makers often choose to use due to their valuable properties. High in vitamin A, C, E, linoleic and oleic acids. Too much can make soap too soft. High in vitamin A and E and antioxidants. High in vitamins A, B, D and E oleic and palmitoleic acids. High in vitamin E and antioxidants like phytosterols. Properties: Conditioning, Moisturizing, Creamy Lather with High Stable Bubbles. 90% ricinoleic acid, which has traditionally been used to help heal skin conditions. High in vitamin E and other antioxidants. It doesn’t fully saponify, so it lends more of its properties to soap after curing. Coconut can be drying if it is over 45% of total oils in a soap IF you do not compensate by increasing the superfat content. it makes a wonderful cleansing, hard bar with great bubbles. High in lioleic acid, omega 6 fatty acids, and antioxidants. All around great oil for soap because it cleanses, moisturizes, and creates nice bubbles. High in vitamins A and E, but can go bad in soap faster than other oils. Use as 5% or less of total oils for a longer lasting bar. Like beeswax and cocoa butter, it doesn’t fully saponify, leaving more to hydropylic (water loving) qualities to help moisturize dry skin. Makes a great, long lasting bar. Make sure to choose a free-range, natural source. High in antioxidants, oleic acid, omega 3 and omega 6 fatty acids. High in Vitamin A and C and antioxidants. Calming, gentle oil used in soaps as an anti-inflammatory and anti-bacterial oil. Gentle oil with little cleansing properties, but high in antioxidants (Vitamin E and polyphenols). Makes a very soft soap and is best paired with a harder fat or oil. Gives a silky feeling to bars. High in vitamins A and E, fatty acids and minerals. Gentle on the skin, Has vitamin A and E and oleic and linoleic acid. All around great ingredient for soap making. Makes a great, long lasting, cleaning and bubbly bar. Make sure to choose a free-range, natural source. You can go into even more depth in my book, Natural Soap Making for Beginners. I am interested in homemade soap. I glad you found us. What country are you in? Tallow properties are listed above. – Sesame oil is good because of its antioxidant properties. It can help a soap bar last longer. Like shea, it can give a soft silky feel to soap. Great for the skin (an overall great oil if you can find pure, well grown. Ours in America is mostly not). – Sunflower is a good sub for olive oil in a recipe. It has a higher cleansing ability than olive oil and makes a good lather. – Peanut oil makes a great lather, but can spoil more quickly, so use it when you’ll be using the soap within a month or two. It has vitamin E and makes a soft soap, so make sure to add harder oils to counter that. Thanks for sharing this, I love your book as well! 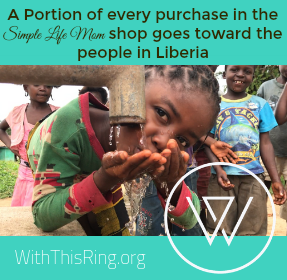 I am just starting my soap business, this site is amazing with all the information provided. I have not use tallow lard. I am using natural ingredients in my soap even though I use maybe an oz. or more of each oils I uses scented oils from Dubai, because I wanted to be different from the others since it seem like the market is bombarded with soap. Please keep all the good information coming, since I am new. it’s a mazing to have a better understanding the function of each oil. thank you for all the information you provided. I’m new in soap making….hoping to make organic liquid soap using sesame oil and turmeric. Please give me some suggestions on that. You’ll need to follow directions for making liquid soap using those ingredients. If you can’t cold or hot process soap, you can always hand mill (or melt) soap bars and add liquid and a small amount of oil and turmeric. The oil won’t be saponified so you can’t add much. You’ll need to emulsify to get them to blend. They will eventually separate and you’ll need to shake before use. I would love it if you could help me with converting ounces to teaspoons and oz. to drops of the essential oils. About 300 drops make 1/2 ounce. Teaspoons vary in size by make so I never use teaspoons to measure essential oils. Hi kelly, when you say olive oil is the same as the olive oil for cooking? I have a massage oil with grape seed, almond, jojoba, and vitamin e oils…Can I use to make soap? No, you have to know exactly how much of each oil you have to know how much lye you need to saponify those oils (turn them into soap).